There is no complete Chinese dinner without a soup, says me. 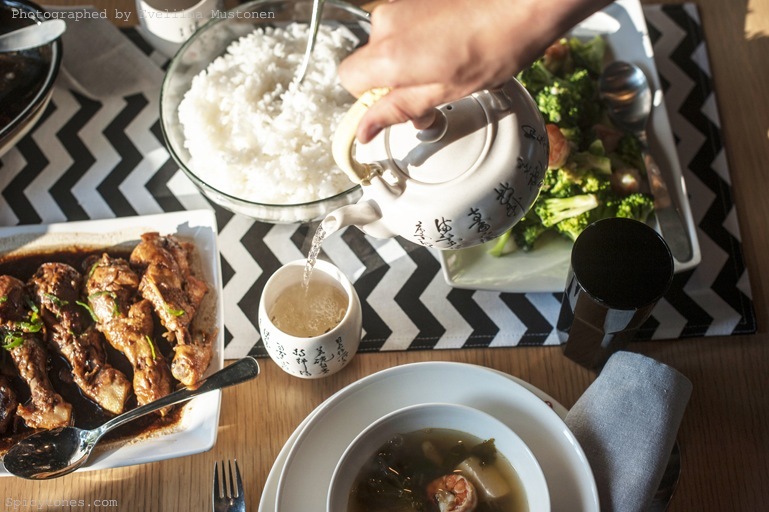 😀 As mentioned before, a classic Chinese home dinner is a combination of 3 dishes plus 1 soup. No matter if it is for two, three or four people. This combination is a hidden sign of welcoming the guests, a proper polite gesture from the host. 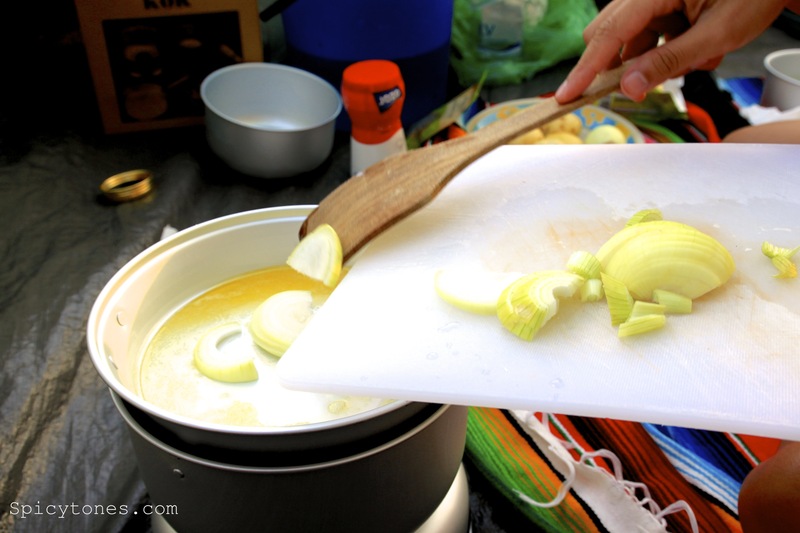 In Malaysia, sometimes it can be more expensive to cook at home than to eat out, especially when a soup is prepared. My mom, the soup master usually puts a whole chicken, a few of dried scallops, dried oysters, dried jujubes, dried goji berries together with some Chinese herbs or root vegetables in a medium size pot and cook for hours. As you can probably imagine how intense the flavor would turn out, no MSG nor salt are needed for her soups. 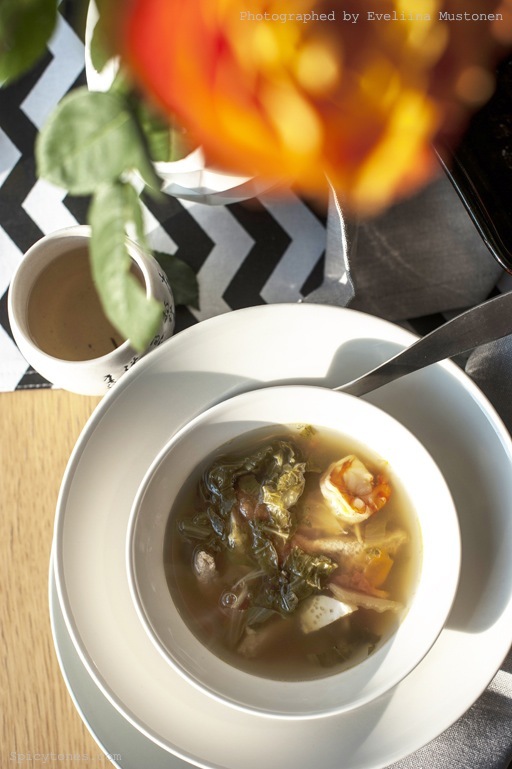 I simply love her chicken soup, a healing effect for my palate, body, mind and soul, hmmm. When I used to worked as a full-time singer in Malaysia, my work normally ended around midnight. And when I came home hungry, my mom would warm up her soup and bring it to me, she knew that I love soups. She would save me a big plate of my favorite dish, stir-fried bean sprouts from the dinner I usually missed, and something like ginger and wine chicken, the one and only, etc. The moment was so sweet. I miss the times when you can go home to mommy. She would cook for me, wash my clothes, take me shopping and stuffs. You see, growing up is not so fun after all. Too bad life is not perfect. Maybe that’s the way it supposed to be, so that you would appreciate things more when you can’t have them around much. Have you realized that chicken seems to be important to us? You see, my grandmother suffered from World War II when the Japanese attacked in Malaysia. She told me that she used to hide in the forest with her parents to avoid the dropping bombs. There was no food in the forest, they were constantly starving. My grandmother and her parents were eating the skins of the tree, leaves, grass and roots from the ground in order to survive. Luckily they did, but they never had a good life even until my mom was born. They were so poor that all the children dropped out from school and had to work. My mom told me that one of their fanciest dinner was the left-over soup from the restaurant in the village, where beef noodle soup was sold as its expertise. My mom and her sisters helped cleaning dirty plates in the restaurant. After work, they would carry home the left-over soup that was supposed to be thrown away. It would be the happiest day in their life! They would eat the soup with some rice in it and it would be a very fulfilling and satisfying meal. This story always makes me feel ashamed to throw away food. But I can imagine the soup that have been cooked all day long must had tasted really good at that moment. Life became easier when everyone has grown up and are able to work for supporting the family. I was raised by my grandparents in their home, since my mom was out working. I remember that in our backyard we used to have our own chicken farm, where my grandfather taught me how to feed Chinese herbs to the chickens to keep them healthy. 🙂 We didn’t eat chicken that often though. It was only for special days like Chinese New Year, festivals, family reunions, etc. Therefore when we had chicken on our dining table, it symbolized happiness. It was when most of the relatives would be around the house talking, laughing, giggling, screaming, and yelling at each others over that loud TV noise. It made me assume that chicken is a sign of celebration, and it was. 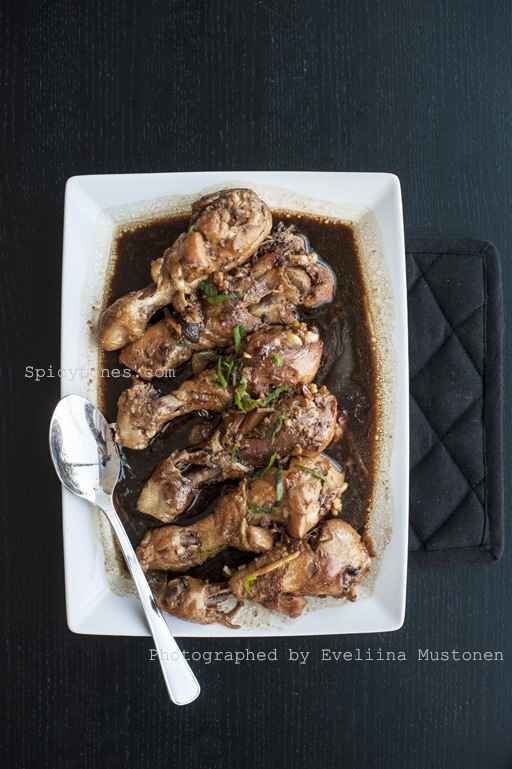 Growing up with my family, I have learned that chicken is a very valuable source of food. But then during my teenage years when life was better, chicken was easily affordable and it was often served on our table. It is not such a precious dish anymore as it used to be. 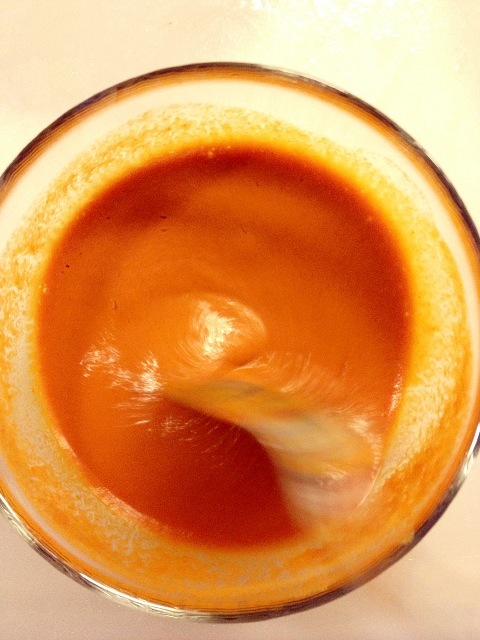 That was when soup became a delightful extra dish when we didn’t have it so often. It takes hours to cook, you’ve got to be patience. Therefore it is very much appreciated. Since I have already made one fish dish (with secret sauce, check here) and one chicken dish for Tuomas and Eveliina, I thought that it would be nice to make the soup ‘almost’ vegetarian to deduct my sin a little, if it ever helps. Long time ago, fresh vegetables and meat were expensive and hard to keep. 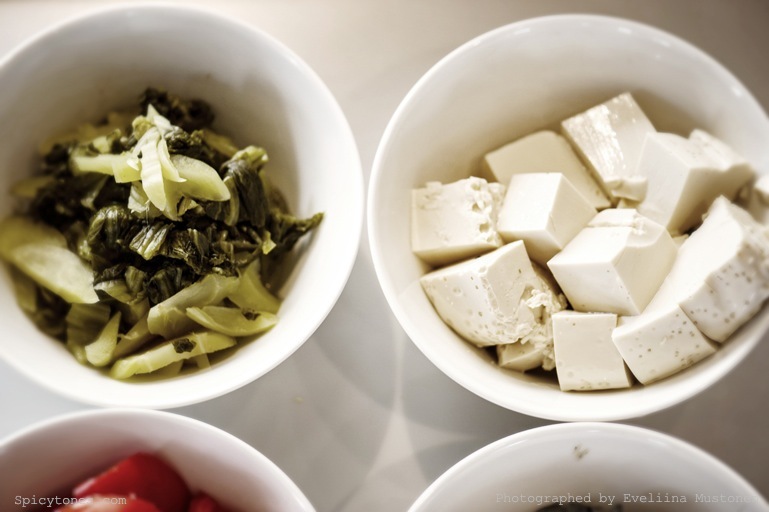 Therefore in China, poor people could only afford preserved vegetable and tofu for their daily meal, like this dish revealing the childhood story of my grandmother. It is actually a dish originated from Teochew region in China, using key ingredients like slices of ginger, tomatoes, preserved mustard and salted plum. 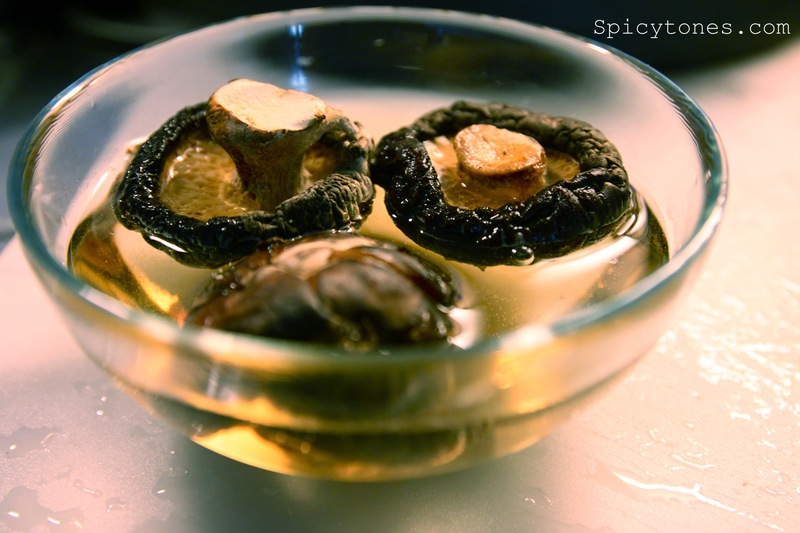 The salty and sour taste makes it a very appetizing dish to serve all year around. 1) In a deep pot, fry ginger slices with oil until fragrant. Add vegetable stock and bring to boil. 2) Add in the preserved green mustard, soy meat, tomatoes, prawns, and salted plum, and cook for 10 minutes with medium heat. 3) Add in tofu and spring onion. Season to taste and served. 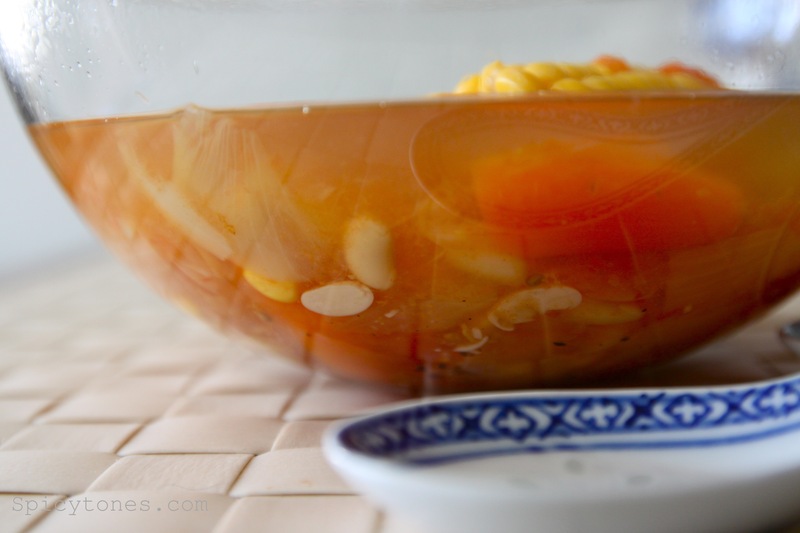 This soup is a clear soup that has a rather mild taste, slightly sour and salty but very appetitive. I have omitted the salted plums this time because it ran out in my fridge. I think one can replace it with tamarind (Assam) to get the sour taste. It is a pretty unusual situation, that my husband and I actually invited ourselves to our friends Tuomas and Eveliina’s place to make dinner for them. 😀 Very different but it was actually really nice. We always have a great time together and they have such a beautiful home and kitchen. In exchange Eveliina, who is a talented, professional photographer took pictures for my blog, what more can I ask for?! It is my first time preparing food for them, therefore I wanted to cook something I really like, something I love the most, which is my mom’s cooking, who is not here in Finland. She lives in malaysia. But my point was to tell you that my mom loves me. Yes she does. 😉 I remember she used to know only a few dishes and she cooked almost the same food every other week. For example ‘the one and only/ 独孤一味’chicken, that is also where the name came from. Later on she became more into cooking and eating, like me. She started to be really good at cooking out of a sudden. 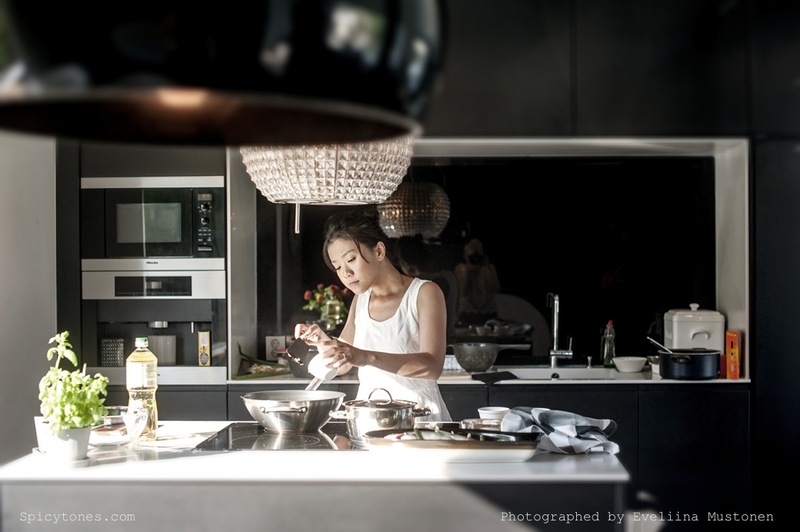 Besides ‘the one and only’, my favorite dishes from her would be ginger chicken cooked in wine, herbal chicken, oat-meal prawn, steamed fish, stir-fried bean sprout, and many more. And you know what, my mom makes the best soup on earth. 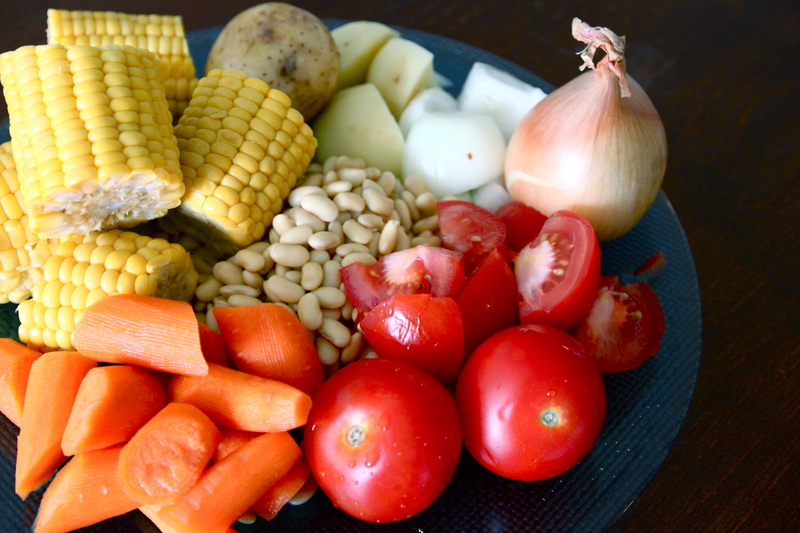 She never hesitated to put in all the ingredients that would cost more than eating out, therefore most of the times salt or pepper are not needed for the soups she makes at all. I wanted to show Tuomas and Eveliina the kind of dinner that I would eat when I go back home. It would be a classic Asian dinner of 3 dishes plus 1 soup. So I decided to make my mom’s signature dish ‘the one and only’, baked fish with secret sauce, stir-fried broccoli with shrimp and soup with tofu and preserved mustard. These dishes are those kinds that are very homey and heart-warming. Unfortunately, I cannot share ‘the one and only’ recipe to you guys because it is a dish created by my grandmother, which she taught my mom how to cook it, and then my mom passed it down to me. I have called and asked my mom about this issue, and she would very much like to keep this family recipe just within ourselves, so I respect her wish. 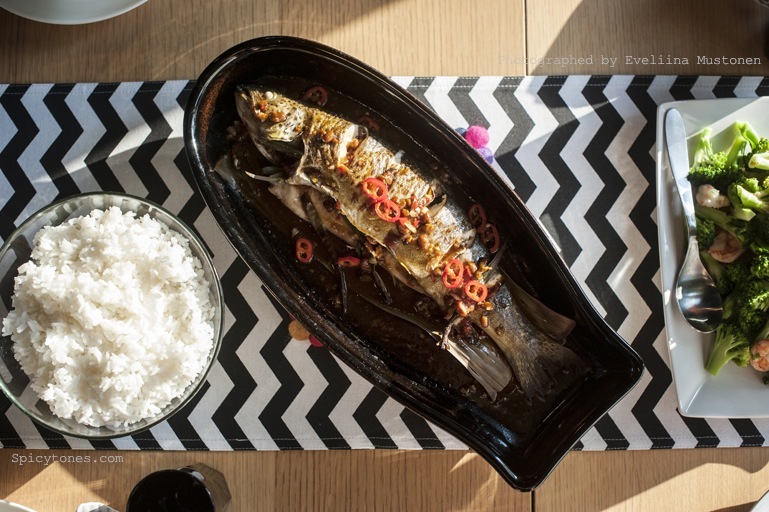 But, to replace this dish I am going to share a secret sauce that I created myself inspired by my mom’s steamed fish. And it is a good stuff. At least Tuomas, Eveliina and their 2 years old child, Matilda who is quite picky about food ate the whole fish! It was ALL gone! In fact, I was digging from the bones to find the last small pieces of meat just to get enough for Matilda when she kept asking for more. So I think they really liked it a lot. 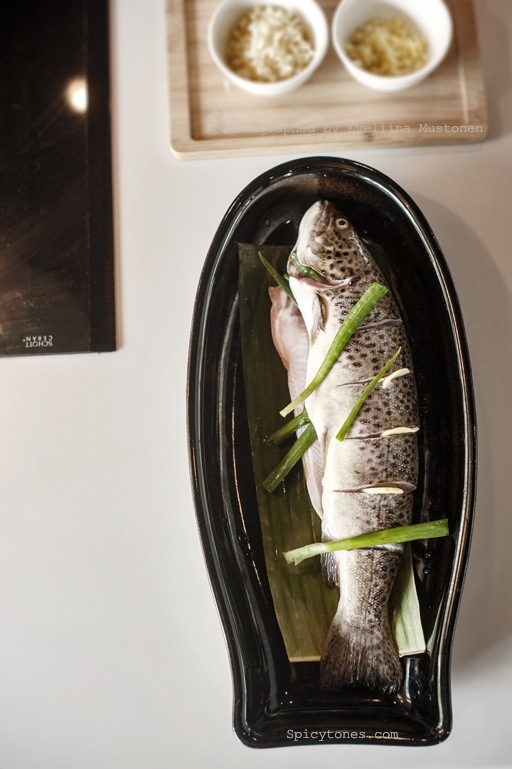 In Finland it is difficult to find a proper steamer anywhere, the only thing available probably would be the bamboo steamer for DimSum which definitely would not fit a fish as a whole. Therefore I tried to bake it, and it turned out perfect. But it also depends on how fresh the fish is. I would not recommend using a frozen fish because it wouldn’t turn out the same. The combination of saltiness from the sauce together with the sweetness from the fresh fish makes you wanna eat more rice. They go so well together! 1) Preheat oven to 220 Celsius. 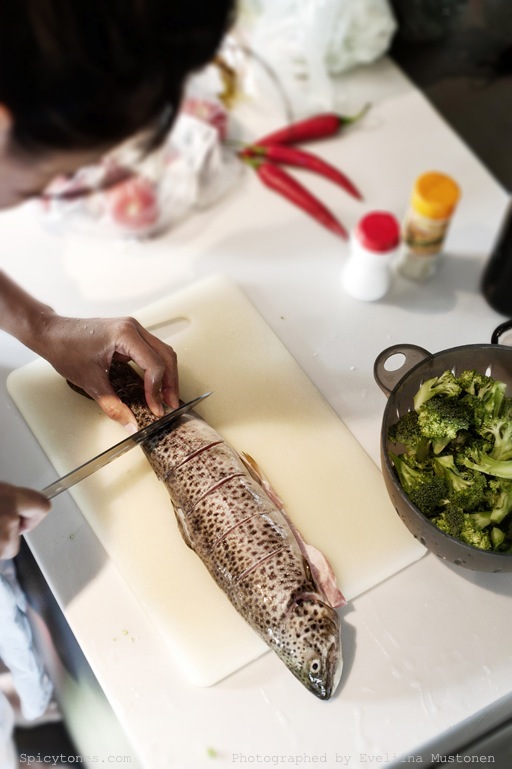 Cut the surface of the fish vertically to help it to cook more evenly (see image below). 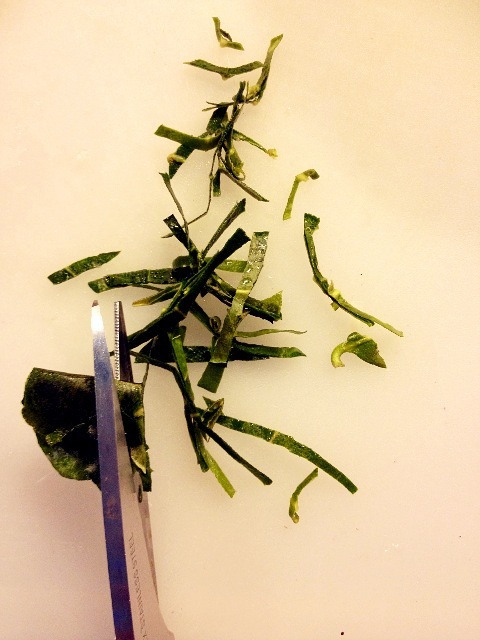 2) Place ginger slices and spring onion inside the cut areas of the fish (tummy and surface). Drizzle oil onto the surface of the fish. 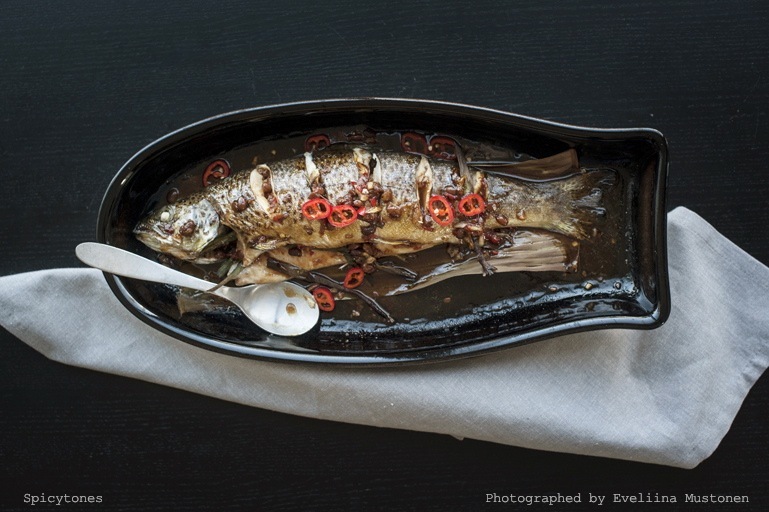 3) Place fish in a container and cook in oven for 20-25 minutes (until cooked completely). 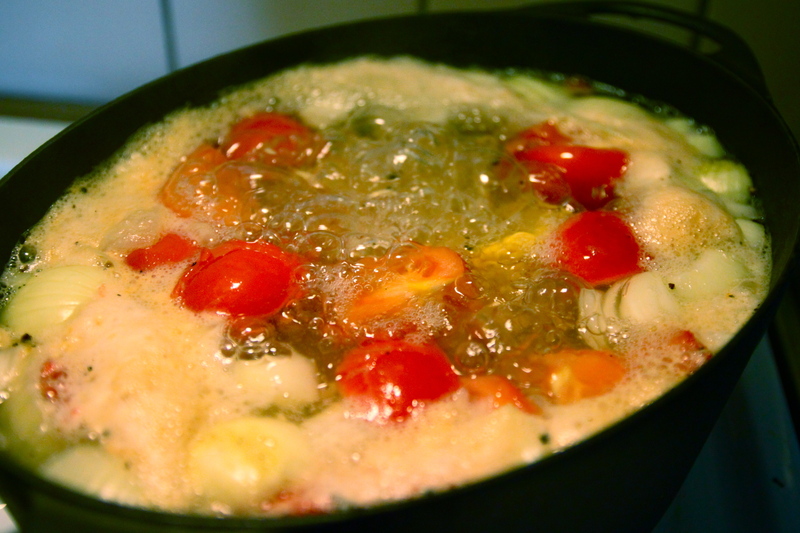 4) Meanwhile, heat up oil in a saucepan and put in garlic, minced ginger and chili. Fry until fragrant. 5) Add in all the remaining ingredients and bring to boil. Pour in hot over the cooked fish and served immediately. Top up with additional chili and spring onion if desired. I am so blessed. This summer has been really warm and I finally have my summer break ‘almost’ free after 3 years of intensive studies pursuing my bachelor’s degree in Hospitality Management. My husband and I already went to Barcelona in July and last week we even drove all the way from Helsinki up north to Norway and back, 3029 km in total. 😀 Imagine I have already had 2 holidays! Yes, I know, I’m so lucky. Barcelona was great, full of delicacies, cultures, architectures and energy! But I’ve got so tired. Don’t get me wrong, it was the excitement of the city; I was overjoyed. 🙂 But what I want to emphasise is that Finland is one of the most beautiful places in the world where you can really let go and loosen up completely, particularly during the summer time. When the sun is up, the water is cool, the sauna steaming hot, fishes jumping out from the lake, sausages grilling on the coal, and cold beers. Birds fly, wind blows. The sound of leaves, the smell of birch, period. And my phone battery ended, how perfect. That was when I finally disconnected from everybody, everything else that does not really matter. The moment of stillness, emptiness and silence is so calming that it made me feel like it was worth dying for. It was real that felt so unreal. If you can only imagine. 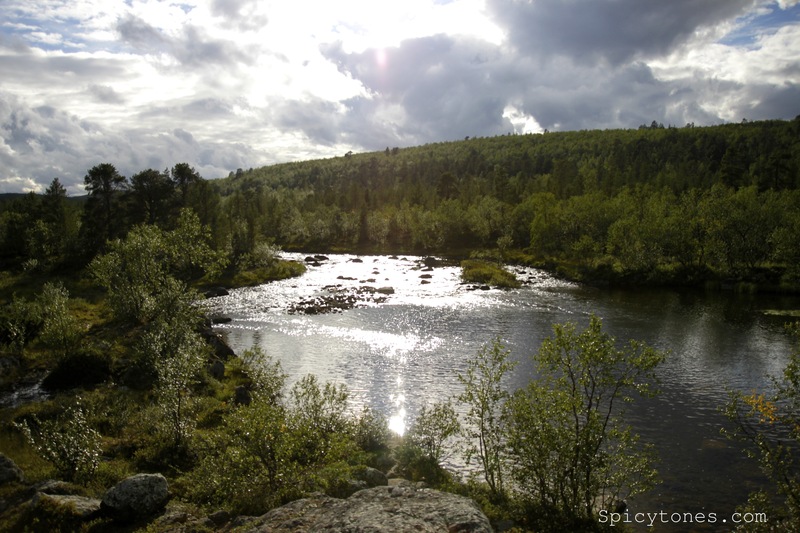 Kaamanen, a village where we camped in Inari, Lapland of Finland. My husband and I were camping along our way, mostly next to the rivers. During our road trip, we met countless reindeers and sheep on the road as expected. We also saw them crossing the river and running under the mountains, amazingly beautiful. I can tell you that we were truly back into the wild. How? 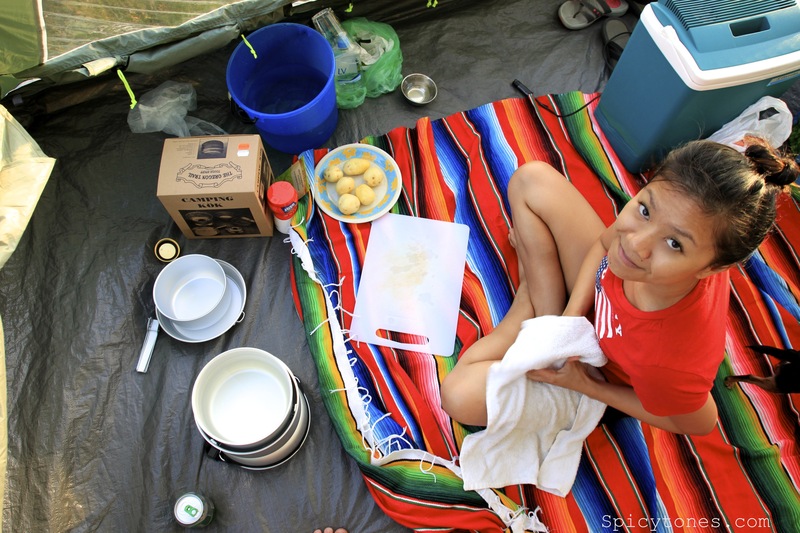 We drank straight from the clear rivers, we cooked and ate organic foods (we picked wild berries and mushrooms), we washed ourselves in the rivers and we also tried to fish our dinner. 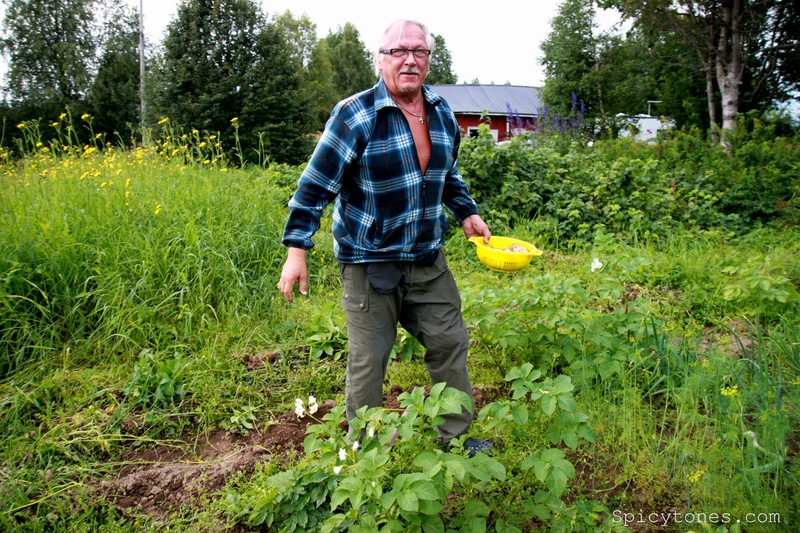 😉 On our way we visited my husband’s uncle Kari in Tervola, where his partner Sinikka has her own garden, how cool! 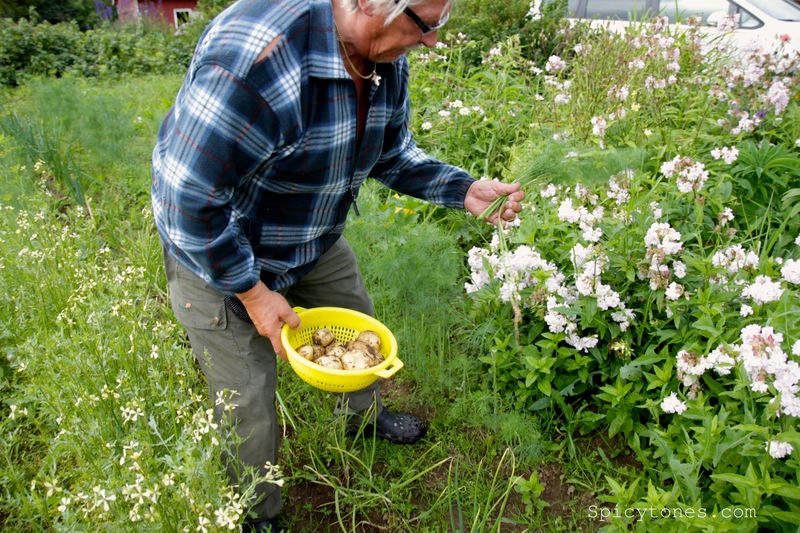 Before we headed on to Norway, Kari gave us some fresh dill, onions, new potatoes and salmon that he caught from the Kemi river next to their home. Here come the new potatoes and fresh dill. Alright back to the business. 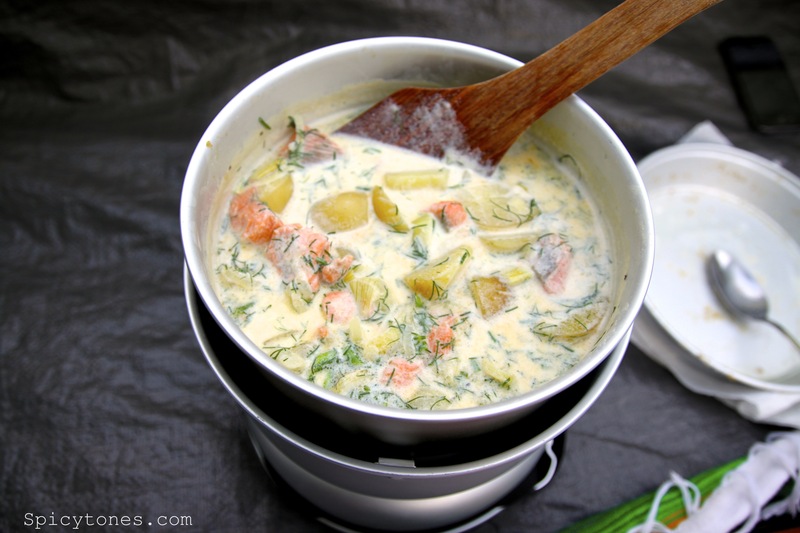 What do you eat when you go into the wild? 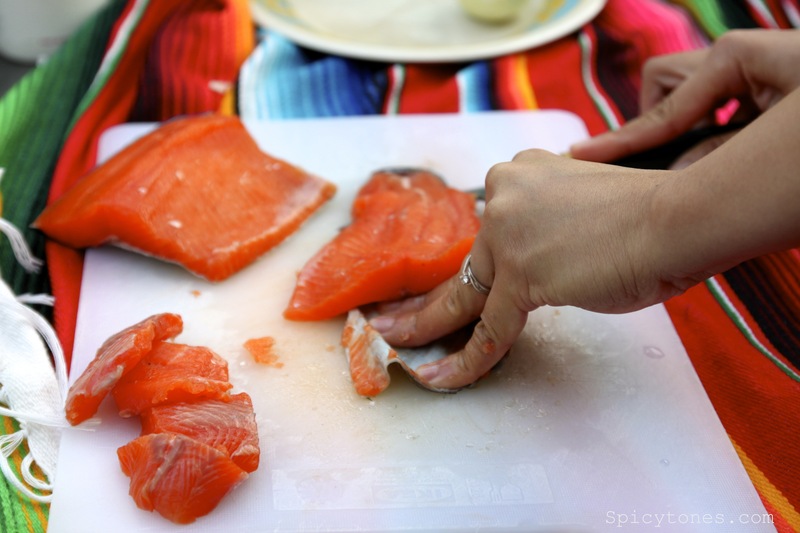 You can make sushi straight from the fresh salmon, if you happen to have sushi rice with you. 😀 Or sashimi. 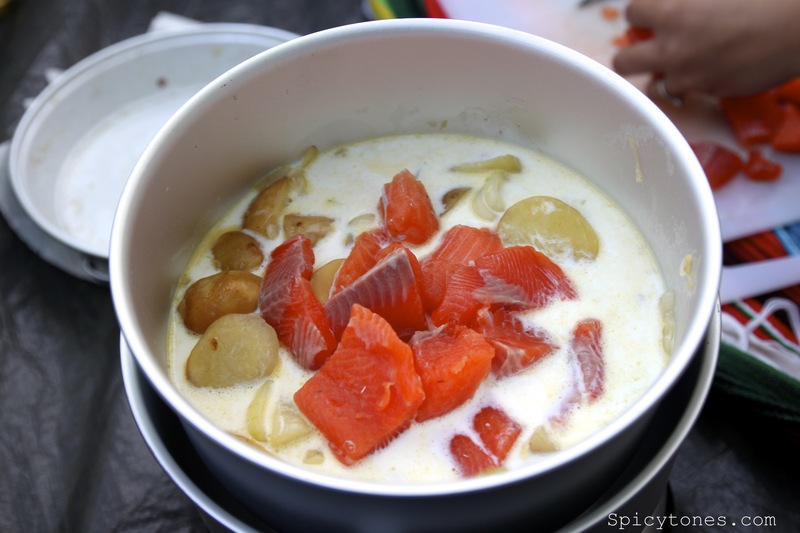 I happened to have fresh dill, onions, new potatoes and salmon, so it called for a Finnish classic cuisine ‘Lohikeitto’, salmon soup. It’s like sweet and sour from China, fish and chips from UK and mac and cheese from US for examples. 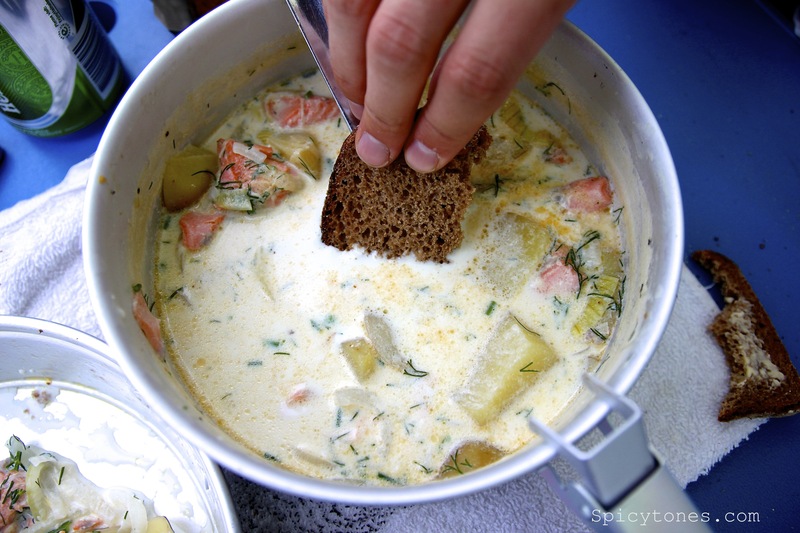 You can’t miss a salmon soup when you visit Finland, at least it is one of the most common Nordic dishes among the locals. It is great all year around, during winter -30 celsius or summer +30 celsius, it tastes always as good! And it’s super easy. Learn it and you won’t regret it. 1) Melt butter in pan/pot. Add sliced onion and fry until fragrant. Add potatoes and sauté until soften (I think it is faster to cook by sauteing than boiling with a portable stove). 2) Add in salmon and sauté until it turns pink (cooked). Add in milk, salt and pepper. Cook with high heat but do not let the milk to boil. 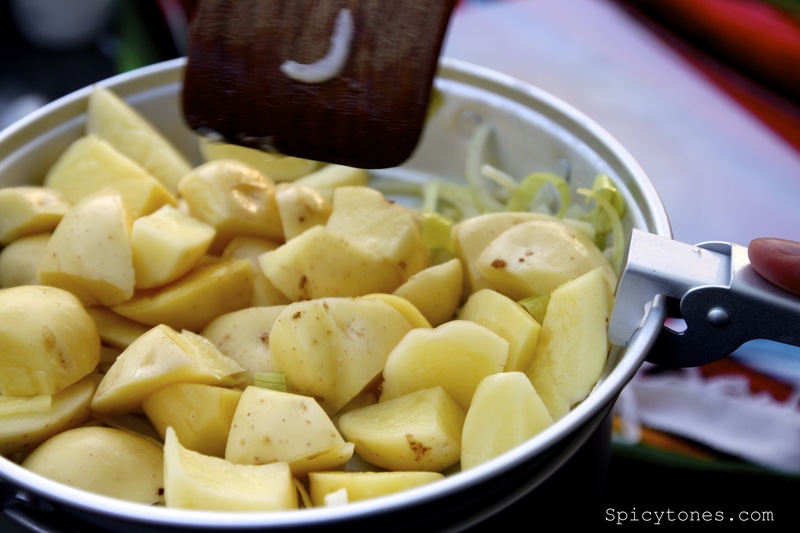 3) Cook the soup until the potatoes are soft and good to eat. Mix in the chopped dill and served warm with rye bread. 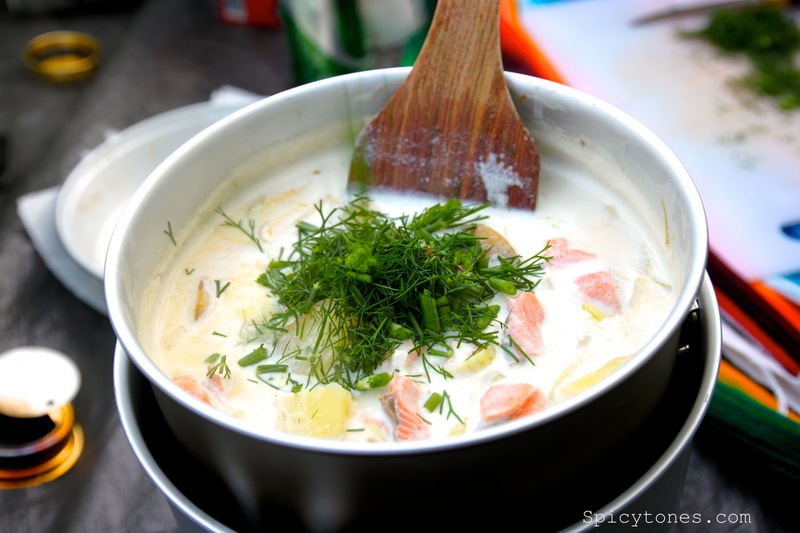 Note: In a proper kitchen, people cook the onion and potatoes with water, and add in salmon and dill just before serving, cream is rather optional. By accident I found it better in taste by just adding milk instead of water. Thanks for my mother-in-law who taught me to use high fat milk for this recipe. It tasted so ‘complete’! Pure satisfaction! In case you wonder, I am a huge fan of noodles! 😀 I eat noodles every other day in my daily life. I guess it is a typical Asian/Chinese habit. 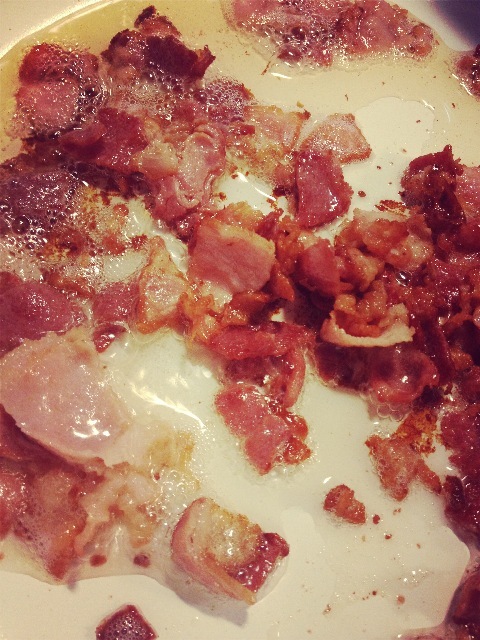 Once I was into a low carb diet, you can imagine how hard it was for me. I felt shaky for not eating carbs, my body simply did not like it at all. Anyway, noodle is being a big part of Asian’s life. We never get bored of it, because you can make so many version of noodle: stir-fry, cold & warm salad, soup, wrapped in spring roll, deep-fried, ‘dry-mixed/干捞’, and even as a sweet dessert. I simply love it! Chinese people eat noodles any time of the day, at least I supposed. For me it has mostly been my breakfast, even in Finland. When I was little, I lived in a village where there is a local noodle hawker stall by the street run by my grandma’s friend. And that was mostly what I ate during my childhood, just before my kindergarden bus came to pick me up. 😀 However, that egg noodle is different than this recipe. It is actually called dumpling noodle soup (云吞面), which I believe is cooked with pork bones broth and usually served with Char Siew and dumplings with minced-pork and prawn filling. But guess what, this vegetable broth that I made is so tasty and sweet that it goes so well with egg noodle! And it’s healthier and lighter too, without the unnecessary animal fat. 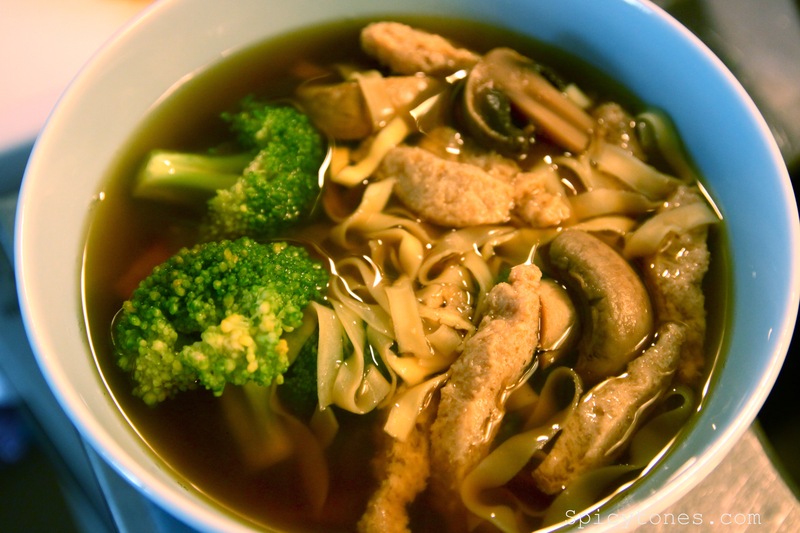 Once you get the broth done, it takes minutes to get your noodle soup ready. Excellent! 1. Cut vegetables in chunks. 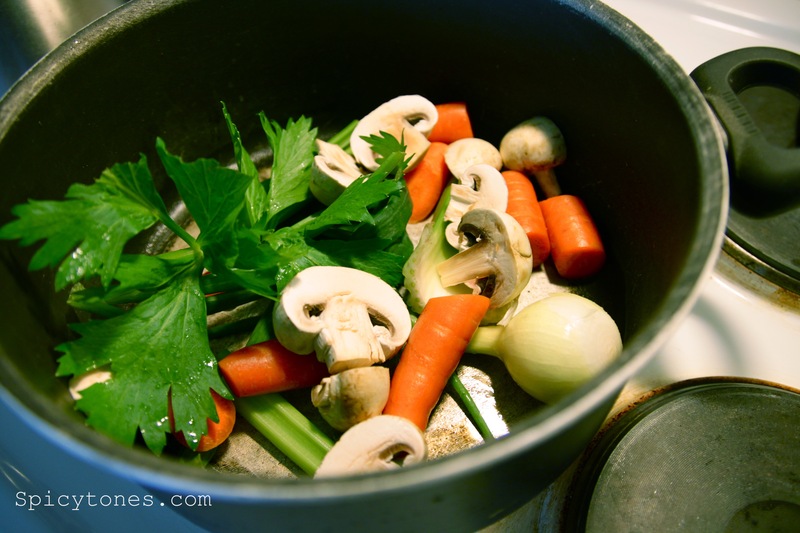 Bring water to boil in a broth pot and add in all the vegetables. 2. When it comes to boil again, turn to medium heat and cook for 2 hours. Season with salt and pepper. Note 1: You can play around with the ingredients, for example by adding ginger, pickled mustard, garlic, dried chill, cabbage, tomato, spring onion, leek, lemongrass, soybean, etc. 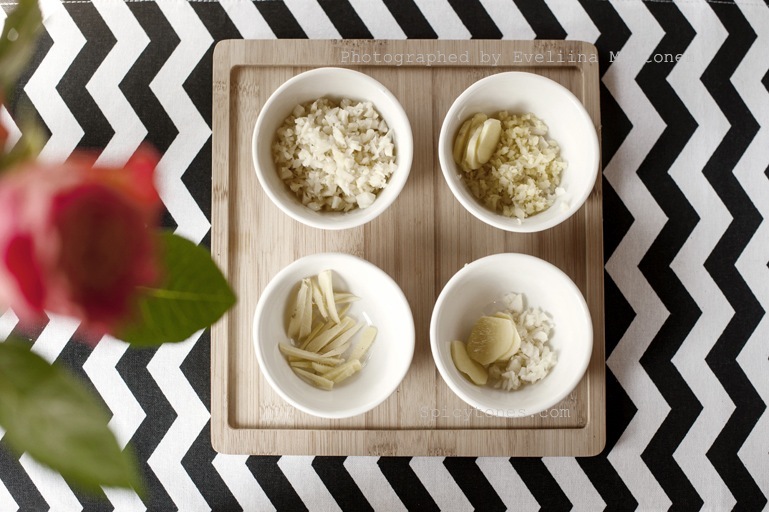 These all bring extra flavour and fragrance to broth/ soup in general. But not too much of each, and please don’t put everything I just said! Otherwise the taste will be overpowering, or completely mess-up. Note 2: You wanna add enough water when making a broth, and not to add water anymore once you get the cooking started. It will ruin it. 😉 Taste bland. 1. 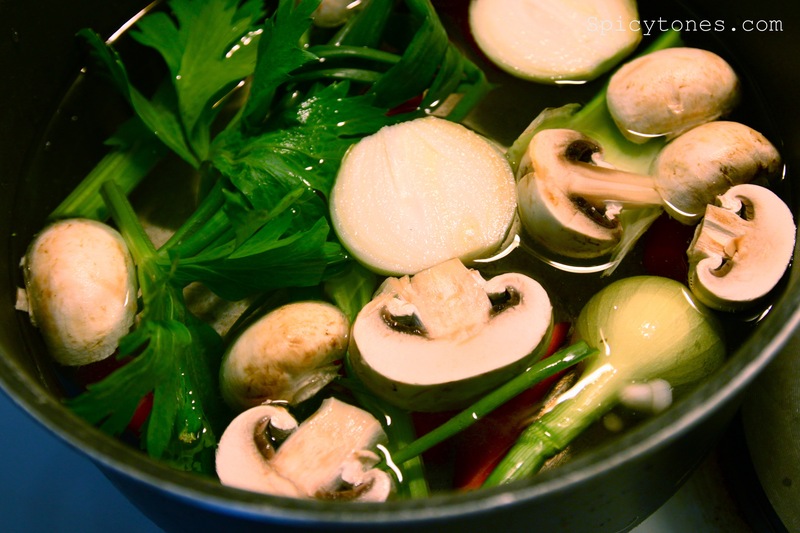 Pour broth in a sauce pan, add in noodles, dried soy meat and vegetables and bring to boil. Cook for another 3 minutes (or depends on how long your noodle needs to be cooked). Season with soy sauce and white pepper. Served with additional fried onions or chopped spring onion. Enjoy! Note 1: Any meat or ingredient could go well with this broth, like pork, tofu, chicken, fish balls, anchovies or dumplings, as well as the vegetables. I like to add in ingredients that help me to balance my carbohydrates, protein and veggies intake. And you should too! 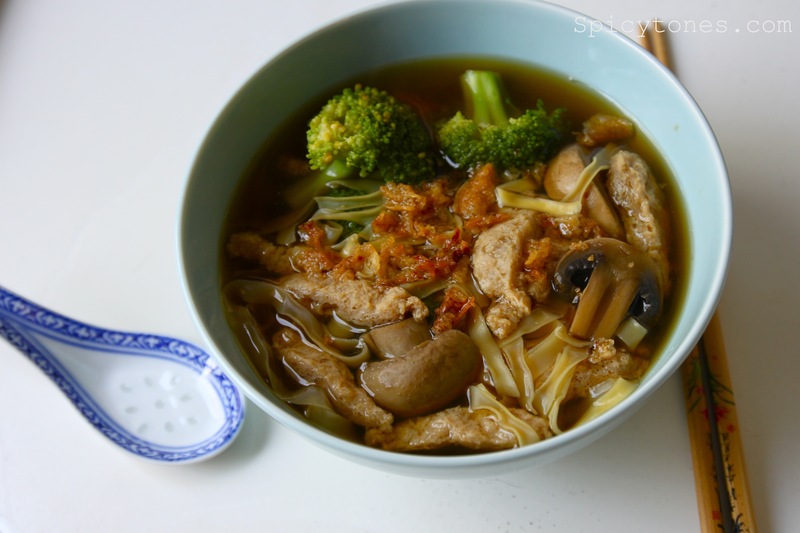 Note 2: Cook the noodle separately if you know your noodle will release too much starch, which can change the flavour of the soup. 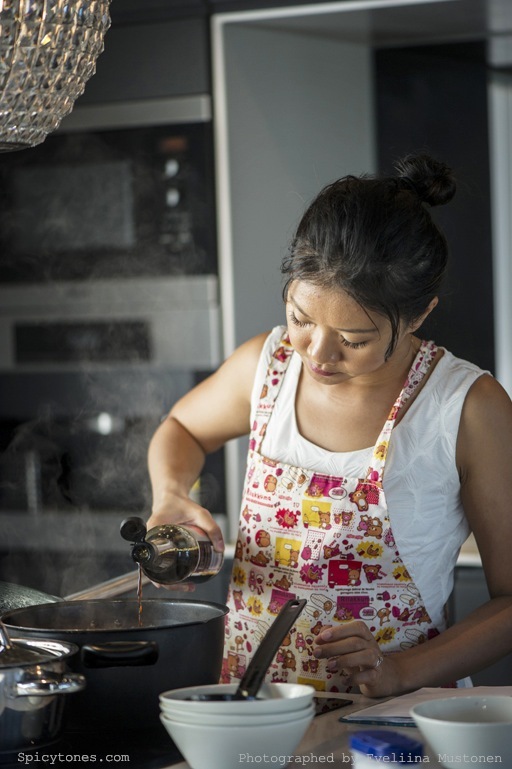 Want to try some Malaysian home cooking that is super easy? Here is one for you, and it happens to be very nutritious and always goes right! ABC soup is by far one of the most commonly known soups in Malaysian home kitchen, I would say that Tom Yam soup ( which influenced by Thailand) and Soup Tulang (Beef bones soup) come next, we shall talk more about them some other time. 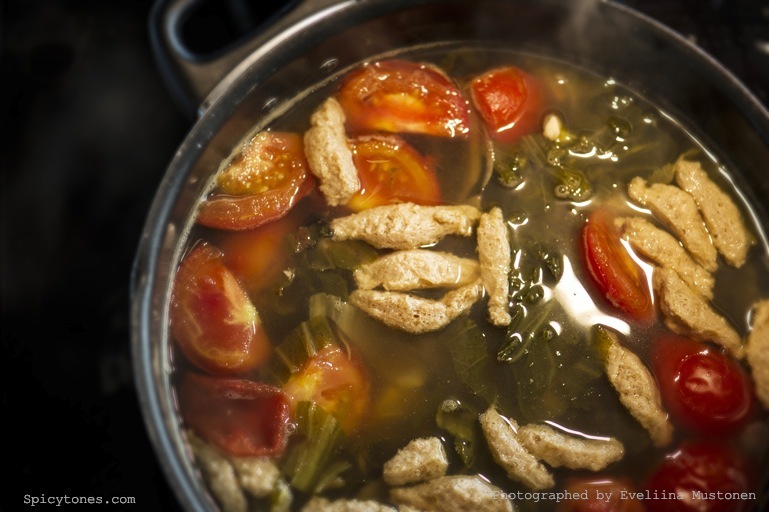 My mom always uses pork ribs or whole chicken to make this soup, and it gives such intense, natural sweet flavour that no salt is needed for the soup at all. It always tastes heavenly good. 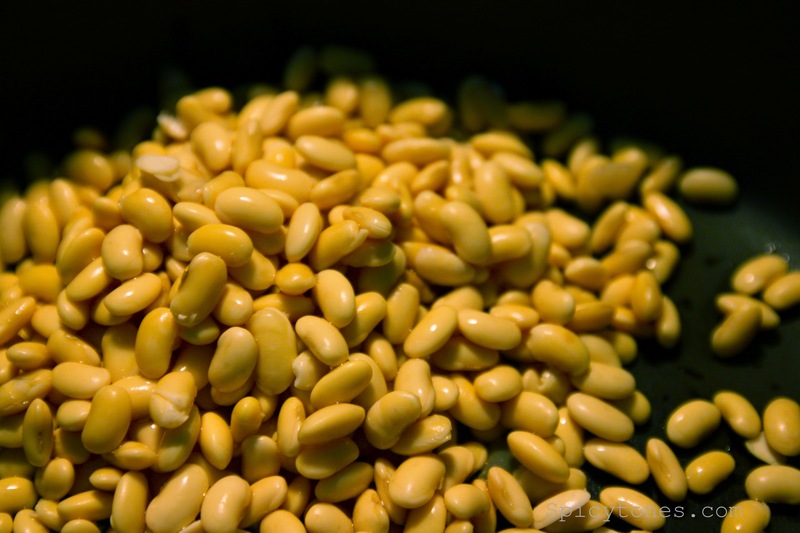 In here I am using soybeans to replace the meat to get my protein and flavours. Okay, you may wonder why I have been posting vegetarian recipes. Yes I am eating more plants now. As mentioned before, I am a bit concerned with the meat industry, moral, ethic, environment, eco and health issues. You know what, it is actually a really big problem in this world! And no, I am not (yet) a vegetarian, more like a ‘flexitarian’ instead. Interesting huh? I read about this new term, if I understood right, it means someone who is becoming a vegetarian but not yet giving up on eating meat. In wikipedia, it says flexitarian is a vegetarian who occasionally eats meat. Well I wouldn’t call myself a vegetarian really if I still eat meat, sometimes. So flexitarian it is! And why am I still ‘sometimes’ eating meat is that, it just tastes so good…..( SORRY! My mind is not strong enough yet) Well it is also a social issue. It just makes my life and everyone else’s life easier if I am not too strict about my diet. 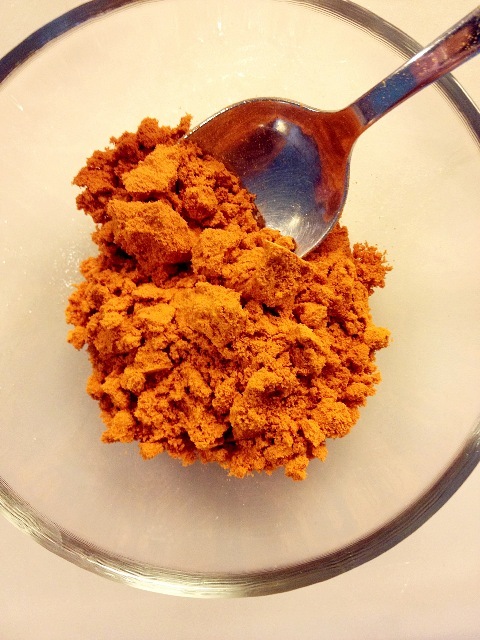 I am trying my best to find meat replacement and substitutes for great recipes. So watch me! 1. Bring water to boiled in a deep pot, add in all the vegetables and crushed black pepper(and pork ribs). Bring to boiled again and turn heat to medium. Cook for 3 hours. 2. Season with salt and ready to serve. Enjoy! This soup can be served already after 1 hour or 2; some people argued that it loses the nutrients if it cooks too long. I personally like a stronger taste, so to me at least 3 hours cooking is needed for that powerful, natural sweet taste to happen in the liquid. 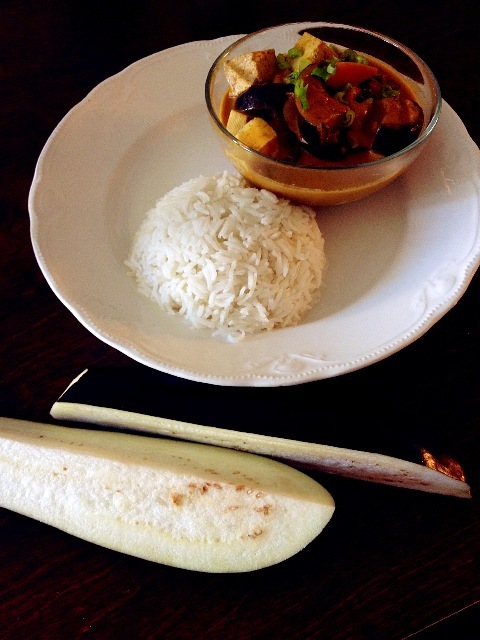 Those of you may also wonder why is this dish Eurasian (European and Asian mix). It is believed that potatoes, carrots and black pepper have been some of those items that were brought in to Malaysia by the Europeans during 15th century. 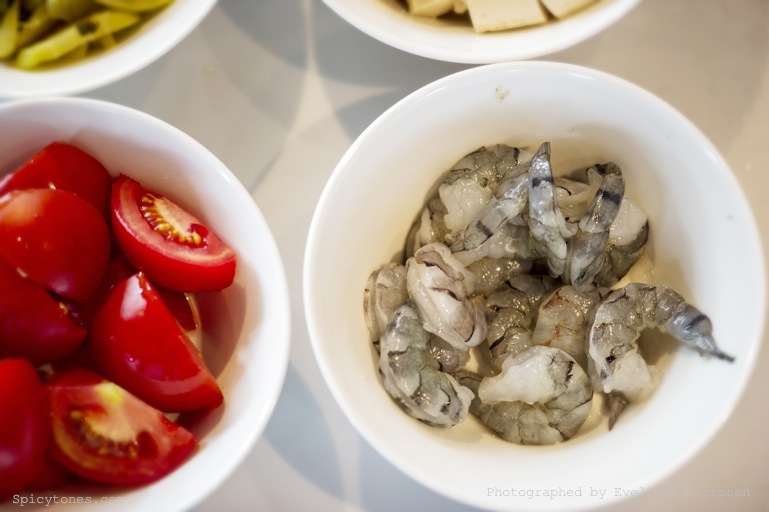 The mixture of cultures directly reflects on the local way of cooking in every homes. And here it is, steaming hot in my bowl. A perfect example of fusion cooking. 😉 Must try! 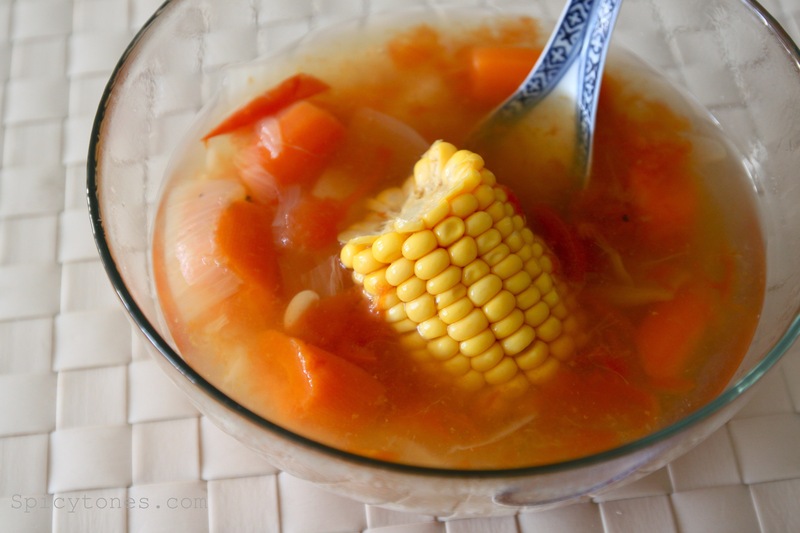 Oh in addition, I always make this soup for my husband whenever he feels sick. Because liquid does him good and it is packed with nutrients. Plus it has such ‘luring’ taste, if you get what I mean. He loves it! I have heard people struggling to make vegetarian food in general. Here me out, if you happen to have a vegetarian relative or friend coming over to your place like I do, this is the perfect dish for you to make. 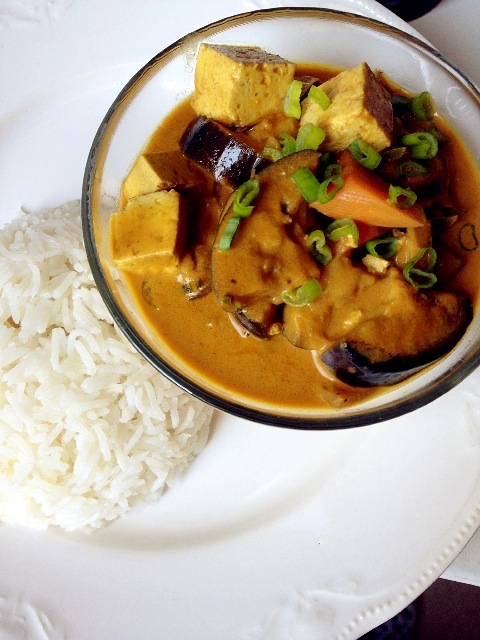 Quick and easy to make, yet tasty, gives good appetite and hard to go wrong with it. You can use these ingredients you find in normal grocery store, but the ones from ethnic store usually bring out a much better taste. 1) Heat up oil in wok, add onion and stir fry until fragrant. 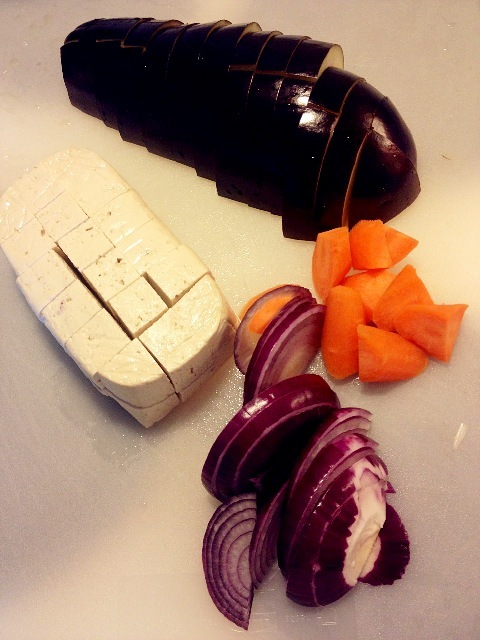 Add carrot and eggplant, cook these vegetables for a few minutes until soften. 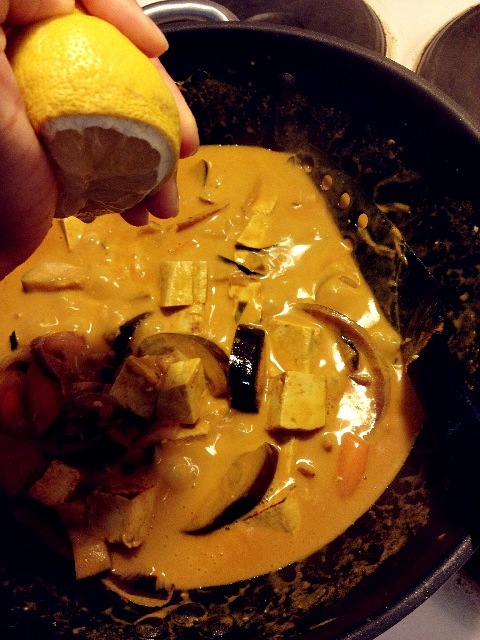 2) Add tofu, kaffir lime leaves and curry paste. Add coconut milk and bring it to boil for 5 minutes. Keep stirring. 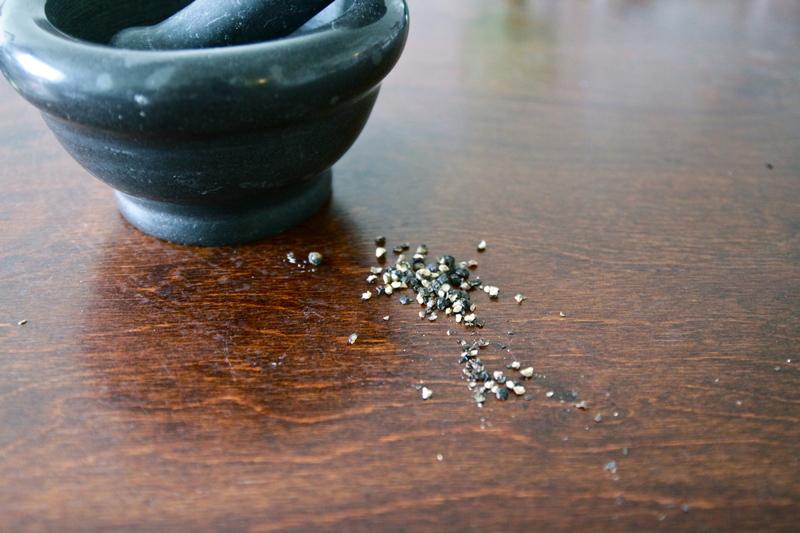 3) Season with salt and pepper. Squeeze lemon juice just before serving. Serve with Jasmin rice. PS: This is a milder version of what an Asian would prefer. 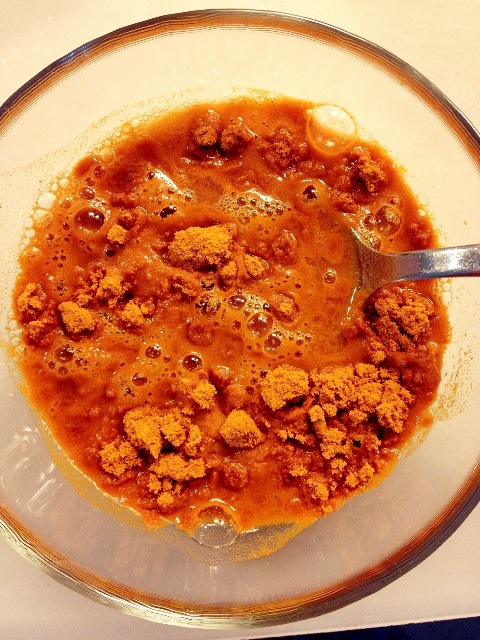 Simply add more curry paste or chili powder for extra hotness. In 2011 my husband and I went to Rome for holiday. The city was so beautiful that we felt in love again. Walking through all the busy streets and allies just to discover local good food. What’s in Rome? Pasta and pizza! 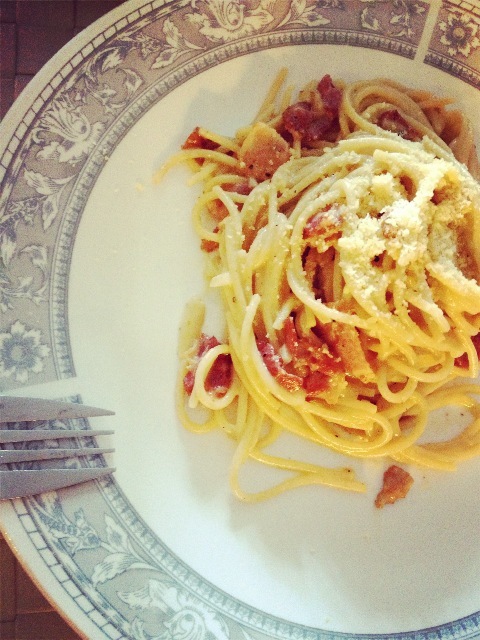 I ate a lot of those but only one of them was my favorite, that is spaghetti alla carbonara. 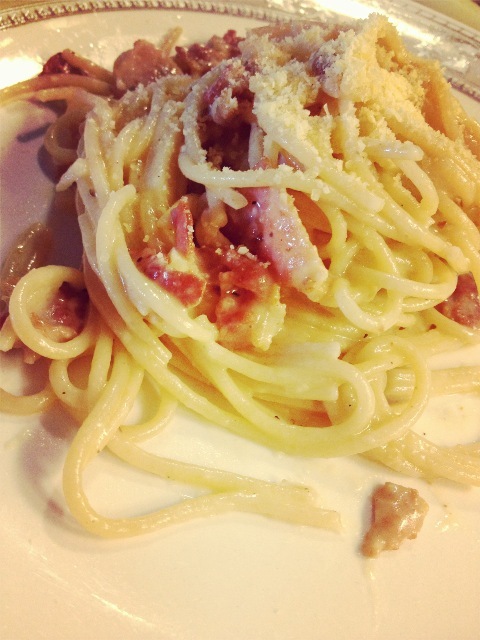 Those chewy, perfectly cooked spaghetti with cheesy sauce packed with bacon fat, tasted like heaven! Sat next to the flowery window with a bottle of Italian white wine, it was just the perfect ending for a long day walk in Rome. Barilla, the most sold pasta brand in Rome and we have one of them. The one I’m using is whole grain. 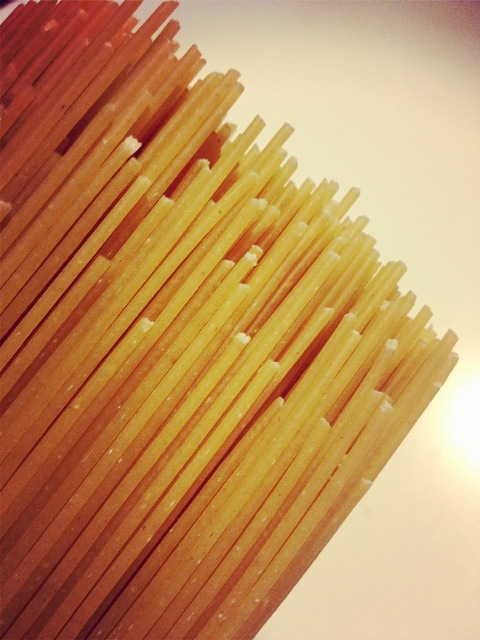 1) Cook spaghetti in boiling water with a pinch of salt for 8-10 minutes. Dry drain, save 1/2 cup of cooking water for later used. 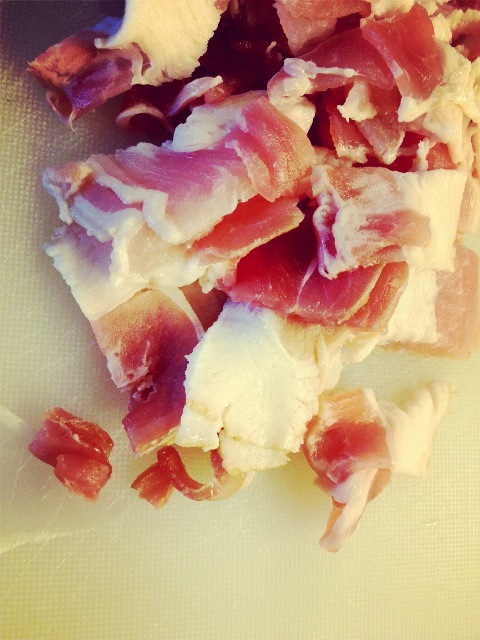 2) Meanwhile, fry bacon in pan with olive oil until brown. Add garlic, stir and fry until fragrance. Mix cooked spaghetti into pan and turn off the heat. Add beaten egg and parmesan cheese. Combine the egg and cheese mixture with pasta, until the cheese dissolve. Add cooking water gradually to prevent drying out. Season with salt and pepper. 3) Serve immediately. Top up with more parmesan cheese. Buon Appetito!